Spondylolisthesis is a medical disorder of the back that usually occurs at the base of the spine. This happens when the vertebrae slips which is present at the base of the spine. The reason behind this slipped vertebrae is commonly a fracture or defect of the wing-shaped parts of the vertebrae. 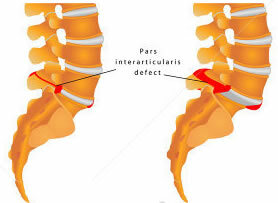 Due to this defect the vertebrae becomes unstable and it starts to slip forward, back ward or even over the bone below. Mainly it is caused from a defect in vertebrae that is present in the patient since birth. Another reason behind this disease maybe an accident or trauma of the spine that cause the vertebrae to break or fracture. Apart from the above mentioned causes this medical condition can also be caused due an infection or disease of the vertebrae. The common symptoms include back pain specially in the lower part of the spine, tightness and stiffness in the muscle, pain in the buttocks legs hat radiates down to the legs because of the compression of the nerve roots. The diagnostic procedure usually starts with the doctor giving the patient a thorough physical examination. He may also carefully research and study the past medical history so as to get to the depth of the problem. As well as order diagnostic tests like CAT scan, MRI as well as X-ray. Doctors believe in conservative treatment methods instead of options like back pain surgery. Spondylolisthesis surgery is an option that is only considered when non-surgical treatments like physical therapy does not seem to work. The most common surgical procedures are laminectomy and fusion. Doctors also give medication like NSAIDs ( nonsteroidal anti-inflammatory drugs) such as ibuprofen, muscle relaxants, as well pain killers.